Looking for that special someone…or something…for your Valentine’s Day? 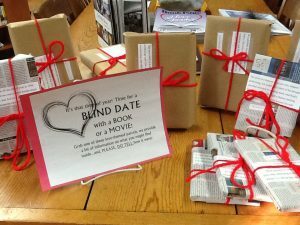 DO come in and partake of our annnual Blind Date with a Book or Movie event! Choose a wrapped title…based on a brief description. You might end up with something you”d have never chosen…based on the cover. Complete with a “rate your date” sheet. It’s a blast!